Today's challenge was graded washes, using Opera magenta, prussian blue and permanent yellow, and allowing the colors to blend on the paper. My friend Patricia Scarborough says it's good to "allow" things to happen and not force them, to let things happen at their own pace. She'd be good at watercolor painting. 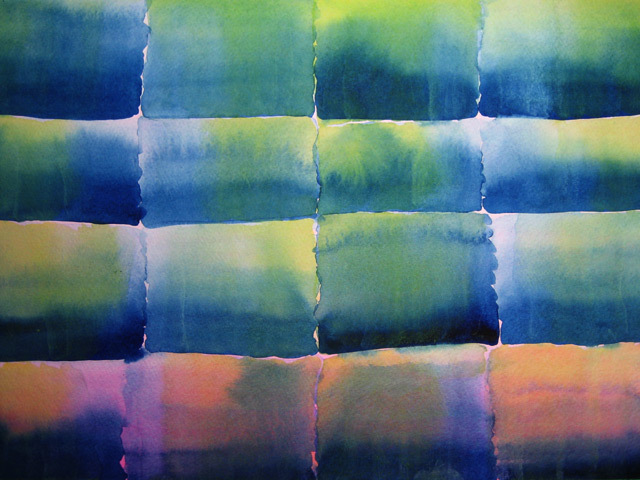 The technique of watercolor is that you dissolve in water the pigments and dyes and binders of the paint, and then you allow the colors to disperse on the paper according to their own characteristics. Some watercolor paints have particles that settle on the paper and emphasize the texture of the paper or the trail of the brush. Some are made of floating powders that dry in a dusty layer wherever the water carries them. Some watercolor paints stain the paper permanently, and some are vulnerable to smudging anytime at the touch of a moist fingertip. Watercolor paintings keep on painting themselves long after the brushes are rinsed and the rags are hung to dry. That's the key to understanding watercolor technique. And the hardest thing about using watercolors is allowing them to respond, on their own, to the physics of the fluid surrounding them. No meddling, no touching-up, just letting it happen. Thanks... I appreciate your comments. mm, soft and lovely. i like the way you describe just letting it happen. I am honored to count you among my circle of friends, artist and otherwise. 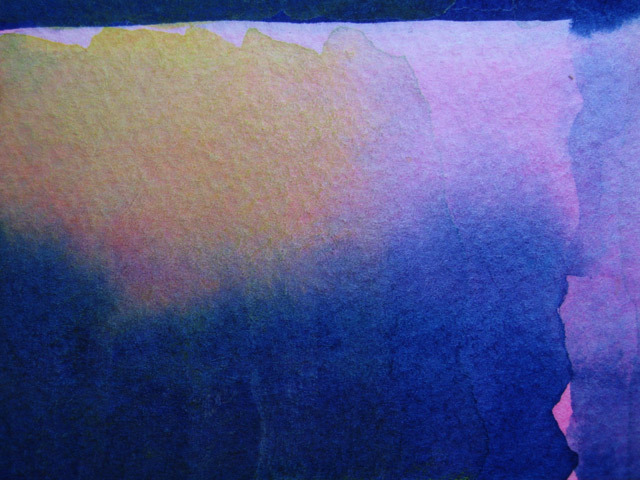 I am primarily a writer and an actor/director, but watercolor has been great for me... I want to increase my skill set and posts like this are SOOO helpful. One of the reasons I chose watercolor is because I am literally not in control. That inspires me, actually. Intriguing to see where the collaboration with the color, the water, and the paper will go. Thanks to you both for your input, Leah and Patricia. I am grateful for how each of you have paved the way for me to post blog entries like this! I'm intrigued with how you describe the way the paper, the paint and the water interacting as a collaboration... that's a very revealing point-of-view to bring to the painting table! The fourth contributor in this collaboration, active or passive, is the artist !